Australia has been invaded. Nothing is as it was. Six teenagers are living out their nightmare in the sanctuary of a hidden valley called Hell. Alone, they make their own rules, protect what is theirs, and struggle for courage and hope in a world changed forever. Seeking supplies, allies, and information, the friends make forays into enemy territory, drawing on nerve and resourcefulness they never even knew they had. As the risks become greater, so too do the sacrifices they must make. 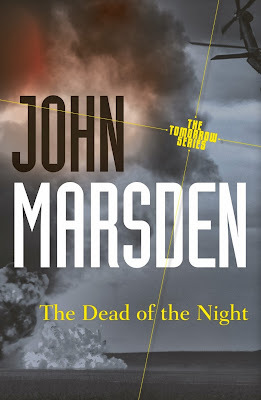 Intense, passionate, and compulsive, The Dead of Night continues the frighteningly real story begun in Tomorrow, When the War Began. A little over a couple of months ago, Australia had been invaded by an unknown foreign enemy and the citizens of the little country town have been detained at the local showgrounds, all except for a group of six teens who are determined to fight for their country, no matter how futile it seems. Ellie, Homer, Fi, Robyn, Chris and Lee are now residing in Hell, a small but secluded spot in which they can stay relatively safe. Since Corrie was wounded and taken to the hospital by Kevin, the two haven't been seen since. It's not surprising that the group is now planning to find them, making the dangerous journey into Wirrawee and wanting nothing more than to find the two teens alive. According to one of the injured, when Corrie was first brought in, they had refused to treat her, while Kevin was beaten and taken to the showgrounds to be held prisoner. The soldiers are referring to colonisation, when sending groups of prisoners to clean homes and farms around town, once the country is firmly under control, millions of their own people will descend upon Australia, taking the land and homes that we had called our own. The group of teens feel the need to do more, taking out the bridge may have stalled the enemy temporarily, but it certainly won't win them the war. They begin watching, taking notes as the soldiers settle into a routine. The plan is to attack one of the convoy's, but as their goal progresses, it's becoming clear that Chris isn't up for the challenge. As the weeks have passed, Chris has increasingly become more withdrawn, relying on the small supply of alcohol found at neighbouring properties. With Corrie in hospital, Kevin a prisoner and now Chris secretly drinking his fears away, the group need to rally like never before. They are losing their fight and their will to live. While scouting one night, they are discovered by a small group of soldiers on patrol. One is brave enough to wrestle Homer to the ground, shots are fired. They say that after you take your first life, killing becomes easier, but for Ellie, that couldn't be further from the truth. Armed with home made explosives, taking out the convoy had been far easier than expected, sadly the action barely a ripple on the enemy's radar. With only Corrie's dying radio to gather outside information, it seems that Australia had lost control of the majority of the country, only the isolate outback not under the enemy's control. It seems the world is forgetting about the invasion, the news being pushed back further and further each bulletin. Only our nearest neighbour New Zealand sending supplies and support. Despite the news reports, surely there must be more pockets of resistance, so the group set out for Risdon, a township on the other side of Hell. They encounter a group of Australian's known as Harvey's Heroes, who have taken it upon themselves to form a community of soldiers to fight back. Men, women and children camped out and planning their next attack. Leaving Chris behind, the teens are taken into the fold and given remedial positions, which doesn't include the plan of attack. The leader they call Harvey, is a man with no experience but runs the community like a military camp. Desperate to return to Hell to retrieve Chris, Harvey forbids it. But it seems the little man with too much power has only led the attack against abandoned vehicles, the former school principal leading his men into a trap on their latest mission. When a gun battle ensures, the teens flee, losing one another but desperate to return to their own base. But when the group reunite at camp, Chris is no where to be found. The radio is now reporting that the southern coastline has now been recaptured, with New Zealand and surrounding regions coming to our aid. When Ellie stumbles upon a work group, she learns that there is a new presence at the showgrounds, a man who takes groups of prisoners away, never to return, choosing army reserves for interrogation, police officers, teachers and community leaders. It seems the enemy is moving forward, faster than anyone could anticipate, bringing in their own families and countrymen to settle in homes throughout the town. The most activity coming from the street in which Fi lived, in the wealthier part of town. Enemy generals and soldiers bustling from house to house, clearly the base of their local operations and they'll be damned if the group will stand idly by and watch their homes be taken. But when they release who is involved, revenge will be sweeter than ever, if they survive what may be their final act of defiance. The Dead of Night is the second installment in the Tomorrow series, in which Australia is invaded by an unknown foreign enemy. I thoroughly enjoyed the first book Tomorrow, When The War Begun, but this one fell flat for me. It didn't have the same tough, rebellious feel but more so an insight into the group, their emotions and relationships. It explores how far each will go to keep themselves safe and protect their country and how to hold onto their humanity. But sadly, it was boring. I craved more action and suspense and the build up to their big act of defiance was far too long. I don't think I'll be continuing on with the series and will base whether or not I read the third installment on Goodreads reviews. It's a seven novel series, and I can't see how it can be stretched that far without losing it's way. Uh oh, sorry to hear this was disappointing! I have these books on my shelf but haven't read it yet, I picked them up after watching the first movie (which was kind of lame but I still liked it lol). Great review Kelly, hope the 3rd one picks up. Hey Jeann, and especially since I had enjoyed the first one. The movie wasn't too flash, but still entertaining, which is what spurred me into reading Tomorrow, When The War Begun, but this one was really disappointing. I don't think I'll bother with the third book, this one barely had a plotline, so I can imagine the series gets much better sadly.